Magic Carpet Cleaning is a company that provides full range of professional services in Paddington W2 at affordable prices for both commercial and domestic properties. If you need your home or office to be cleaned, just call 0208 861 097 and leave the rest to us. All our employees strive for meeting each of our customer’s expectations. We strictly follow our company policy related to the health of our customers and we use only 100% safe eco-friendly detergents. We do not use hidden conditions and fees. Our staff consists of highly qualified professionals. Their skills are certified which is a guarantee for quality. With us, you receive a 100% guarantee on the quality of service. This method is suitable for both private houses and offices. The hot water extraction approach is probably the most effective method. It is particularly suitable for families with children and pets because it successfully eliminates the germs responsible for diseases and allergies in your home, without using an aggressive detergents. This makes it preferred also by people with allergies. The cleaning process consists of injecting hot water under high pressure and extracting it along with the dirt. Our expert rug cleaners are certified and carefully vetted. Dry compound is a fast and efficient method recommended for cleaning commercial properties, like stores, offices, banks and other public spaces. People prefer this approach because it does not use water or steam which means that the treated surface does not have to be left to dry and can be used immediately after service. Moreover, it prevents from mold which grows in an environment with higher relative humidity. The detergents we use are 98% biodegradable for an effective environment protection. 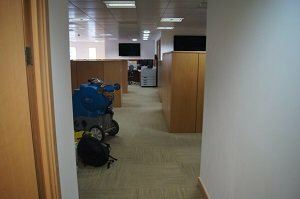 We invest in our professional carpet cleaners a lot and make sure they are well trained and work in a safe and friendly environment to stimulate their work. They are able to deal with both natural and synthetic materials, efficiently removing all types of stubborn stains like coffee, traces of pet urine, wine, food, chewing gum, chocolate, etc. If you dream of a cleaner home or office without dirt, blemishes or dust, contact our cleaning professionals at 0208 861 0979!